Brother Jimmy's is not a bad place to hang out to grab a couple of beers after work. If you're going there to eat you'll notice that people can get real loud and rowdy by the bar when there is a game going on. That's because this place feels very much like a sports bar since it's got giant, flat screen TVs all around the restaurant with different sports channels on. The menu here features some well-known southern dishes and the dish that caught my eye was the fried green tomatoes. This traditional food that supposedly originated from the South is something that I've heard about but never had before. It was highly recommended by the server so I had to give it a try. But I really wasn't overly impressed with the dish. The green tomatoes had a tart, piquant taste to it, which I liked but the problem lies with the batter. The batter of the fried green tomato is typically made with cornmeal and fried with bacon fat to give it some flavor, but this tasted like they've used some store bought breadcrumbs that's gone stale from sitting on the shelf too long. For the main dish, I ordered the blackened catfish Po' Boy. Now this dish, I liked. The fish tasted really fresh and it was seasoned nicely with a mixture of Cajun spices. It came on a warm, toasted bun and the Cajun mayo on this sandwich really sealed the deal! Overall, it was flavorful and very good. Brother Jimmy's is known for its ribs and I wouldn't come here without ordering some. 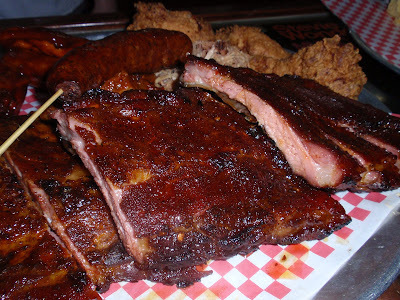 The sauce on the Northern style ribs was tangy and the fall-of-the-bone meat was very tender and good. 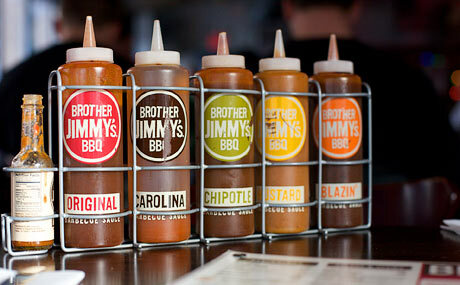 Brother Jimmy's has seven different locations all around Manhattan, but the one I've gone to was in Union Square. Be prepared to loosen your belt buckle if you're heading over there to eat.